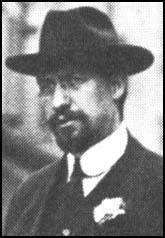 Carlo Tresca was born in Italy in 1879. After being active in the Italian Railroad Workers' Federation, Tresca moved to the United States in 1904. Elected secretary of the Italian Socialist Federation of North America and a member of the Industrial Workers of the World (IWW), he took part in strikes of Pennsylvania coal miners before becoming involved in the important industrial disputes in Lawrence and Paterson. Tresca, who lived with Elizabeth Gurley Flynn, was editor of the anti-fascist newspaper, Il Martello (The Hammer) for over 20 years. Carlo Tresco was leader of the Anti-Fascist Alliance and was mysteriously assassinated in New York City in 1943.